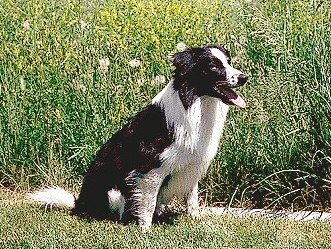 The Border Collie is recognized as the finest sheep-herding dog in the world. While appearance has been a major concern in many breeds, the working ability has always been the prime criterion in this breed. Intelligence and trainability are the genuine of the Border Collie. Alert and eager, the breed can display single- mindedness for the task at hand. Affectionate with friends, the Border Collie may be reserved toward strangers. Instances of extreme shyness or aggressiveness are virtually unknown. Swift, agile, tireless and with an incredible desire to work, the Border Collie is very active. This high-energy dog needs to work and if there are no sheep handy, it will thrive on such activities as fly ball, agility, Frisbee-catching and advanced obedience. Size: A medium-sized dog, the height at the withers varies from 18-22 in 46-56 cm. The Border Collie has strong but not excessive bone and should always have muscle and substance without appearing heavy. Coat: There are two varieties of coat in the Border Collie. The smooth coat is short over the entire body with some feathering on the forelegs and chest. The rough coat is medium to long and may be flat or slightly wavy. Both varieties carry a soft undercoat beneath the weather-resistant outer coat.